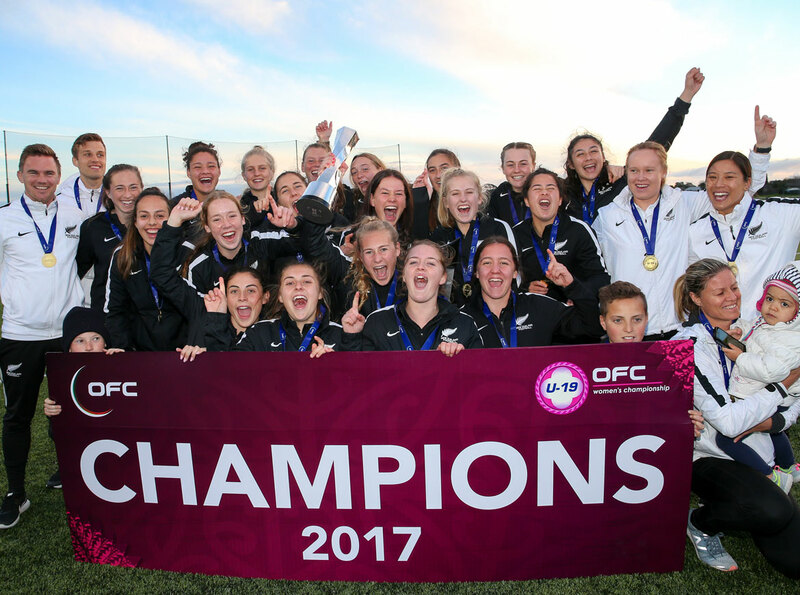 Tonga couldn’t prevent New Zealand from making it a clean sweep of the OFC U-19 Women’s Championship, with the six-time champions taking home a 9-0 victory to close out their successful campaign at Ngahue Reserve today. Fiji secured their best ever placing at an OFC U-19 Women’s event after beating New Caledonia 2-1 to finish second behind the Kiwis, while Papua New Guinea drew 1-1 with Samoa in the day’s final encounter to ensure their place on the podium. New Zealand coach Gareth Turnbull said his side played some of the best football of the campaign in in the match against Tonga. “We played really well in the first half, probably the best 45 minutes of our campaign,” he said. With the title wrapped up Turnbull said it’s time to start thinking about the next stage of the campaign – the FIFA U-20 Women’s World Cup in France next year. “We’ve had a few days for it to sink in I guess, but it’s certainly nice and it’s a big part of the qualification through Oceania to experience world cups. Tonga employed a defensive strategy but the New Zealanders snuck out to a five goal lead at half-time with little resistance from their opponents. Striker Hannah Blake scored the first goal of the game after eight minutes following an excellent set piece from her team mates, then Emma Main followed up with four more in fairly quick succession. Tonga were left shell-shocked by their opponents’ burst but rallied well despite the New Zealanders throwing everything at their attack to add to their tally, Tonga goalkeeper Mele Akolo drew on all her talents to make numerous saves. In the second half, the Tongans had solidified their defence and for the first 30 minutes kept their opponents at bay. This left the Kiwis somewhat frustrated, however by the 77th minute they managed to find a crack in the defence. The side added four goals, with Deven Jackson, Michaela Foster and Grace Jale all getting on the board before reserve keeper Helen Tahitua helped take her opponents to nine with an own goal in additional time. Coach Christian Koaneti was happy his side stuck to the game plan, even though New Zealand still managed to score. ‘’First of all, credit to Gareth and his girls, we came into this game knowing New Zealand would be tough,” Koaneti said. “We tried to stay compact during our game and work on our defence, but in the end New Zealand was too tough. With a podium finish up for grabs for either Fiji or New Caledonia going into their final match of the tournament, it was always going to be an entertaining encounter. The 2-1 win for Fiji is a small reward in what has been an emotionally testing tournament for the debutants. “It has been a heart-touching tournament for us,” coach Saroj Kumar said. “Losing our goalkeeper and then coming here and winning silver – it’s wonderful for us. “It was a tough game today, they played their cards well but the girls were really focused on winning and we tried to press them high when we had the wind. Fiji had the best chances in the first half with the wind at their backs, testing keeper Karine Xozame’s aerial judgement as well as the offside trap. New Caledonia had a couple of their own opportunities but were unable to get close enough to really test Fijian goalkeeper Ateca Tuwa who had an excellent command of the penalty area, plus a solid line of defence in front of her. A foul on striker Cema Nasau saw Fiji pick up a free kick just off the top of the penalty area which captain Luisa Tamanitoakula lined up. Struck perfectly, with a little assistance from the cross-field breeze, the ball floated into the top corner to open the scoring. The second came three minutes later as Tamanitoakula went in at goal with just Xozame to beat, playing it outside the keeper but inside the upright to give her side a two goal lead at the break. With the wind on their side for the second half, New Caledonia made the most of it their chances and it paid off in the 55th minute. Alice Wenessia curled a corner in from the left, dropping it right in front of the goal mouth where a waiting Isabelle Hnaweongo headed home. The goal revitalised New Caledonia who were able to up the pressure on their opponents, however despite their best efforts were unable to pull themselves in line with Fiji to finish on a high. New Caledonia coach Kamali Fitialeata said to end with a defeat is a tough way to close out the tournament. “The first half we didn’t play too well, we let them dominate us and the two goals they scored hurt us,” he said. The competition wrapped up with Samoa taking on Papua New Guinea – who had already claimed their third place finish with Fiji’s victory over New Caledonia – in an inseparable 90 minute battle which ended with the two sides locked at 1-1. Papua New Guinea dominated possession with their quick passing through the middle, but the Samoa backline managed to hold out the speedy Melanesians until the 41st minute, when Nicollete Ageva lived up to her reputation and found the back of net to edge her side ahead. Samoa didn’t drop their heads however, netting an equaliser in the last play of the first half after being awarded a free kick. Samoa defender Hunter Malaki lined up the shot and fired a powerful attempt over the gloves of Amatha Mistera to earn her second goal of the competition. Both teams returned to the field eager for a winner, but impressive defending from both backlines – and countless saves from Mistera and Jecky Toma – denied a second goal for either team. After a dominant performance from her side, Papua New Guinea coach Rachel Wadunah was disappointed not to sink a well-deserved second goal but was pleased with the strength shown by her players against a talented and physical Samoa. “The performance was good but the finishes were not there. They held the ball, they played good one-twos, and they were able to keep possession of the ball but they were not able to finish it off,” she said. Samoa coach Martin Tamasese was also disappointed not to claim three points but was impressed with the gutsy battle displayed by his young side. “I’m happy with today’s game. We really wanted to win this last one but we are grateful with the end result,” he said. Champions New Zealand picked up the Fairplay Award, going five matches without a single caution, and in the individual awards, an impressive display from Emma Main saw her skip past her teammates Samantha Tawharu and Hannah Blake to take home the Golden Boot award for her 11 goals in five games. As well as taking home their silver medals, Fiji also scooped a couple of individual awards of their own. Goalkeeper Ateca Tuwa took home the Golden Glove, while captain Luisa Tamanitoakula earned the Golden Ball for player of the tournament.